Another great recipe from Chef Linda of Esther’s Kitchen!! 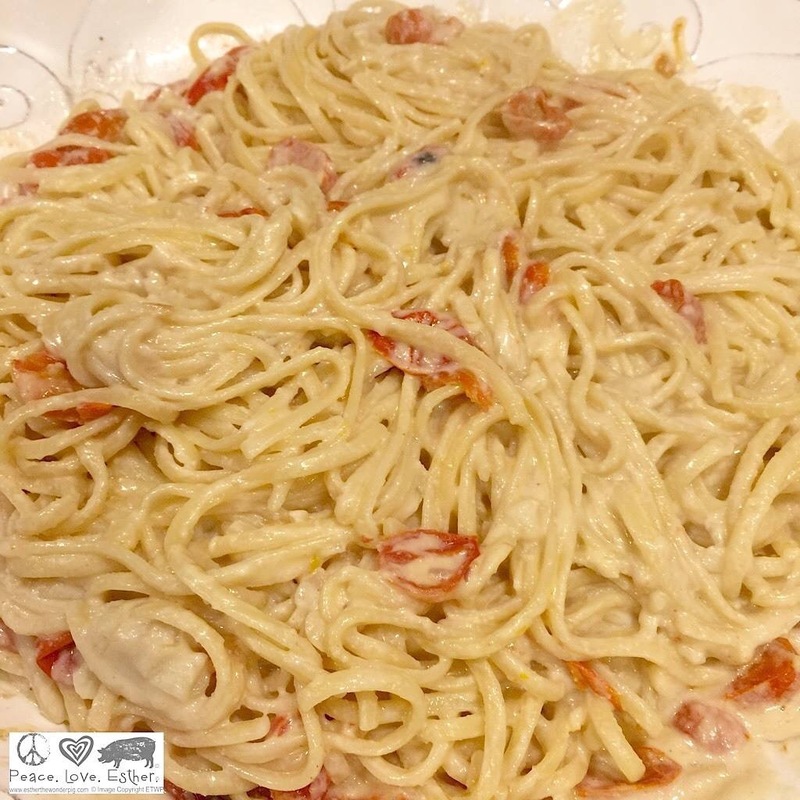 We made this Creamy Alfredo Sauce with Linguine and Roasted Tomatoes that serves 6 hearty portions. This meal comes together in about 30 minutes which is perfect for weeknight meals. The sauce is extra creamy with lots of garlic flavor. In addition to the roasted tomatoes, you can add spinach, broccoli and faux meat substitutes. We love to hear and see what our friend’s are making here. Please let us know how you prepared your creamy pasta dish. Enjoy! 1. Cook your pasta per the package directions. 2. Preheat the oven to 400F. Line a baking tray with parchment paper. Spray the parchment paper. Spread out the tomato halves on the parchment paper. Spray the tomatoes with cooking spray. Evenly grind fresh black pepper and salt over the tomatoes. Roast the tomatoes for 18 minutes. 3. In a large saute pan, heat the Earth Balance and olive oil over medium heat. Add the shallots and garlic. Saute for approximately 4 minutes. 4. Place the cashews in a food processor and process on high until smooth. Add 1 cup almond milk and process until combined and smooth, scraping the bottom and sides of the food processor. Add this mixture in the saute pan with the shallots and garlic. Add the remaining almond milk and additional salt and pepper to taste. Stir until smooth. Cook for 10-12 minutes over medium-low heat, scraping the sides of the pan. Once the sauce begins to bubble, stir in the nutritional yeast and roasted tomatoes. Stir until combined. 5. Combine the cooked pasta and sauce in a large serving bowl. Serve with a side salad, bread, Esther Approved parmesan cheese or nutritional yeast. This entry was posted in Health/Wellness by houseof9lives. Bookmark the permalink. I know it will be!! I haven’t made it yet, but these recipes can’t miss!! Thanks for commenting! !